Born and raised in the Northwest, Samuel Decker developed an interest in art and working with his hands at a young age. He began working as a potter in his early teens. He discovered the art of glass in 1998 and realized that this was his true calling. He was on the team of glass blowers for Dale Chihuly in Seattle for nine years. He has also blown glass in Finland and Murano and has assisted many world renowned artists, including the master Italian blower Pino Signoretto, as well as James Mongrain, Paul DeSomma, Charlie Parriott in the US. He started his own company, Shantitown Glass in 2003 in Seattle and then Samuel Art Glass, LLC in 2007. Samuel opened his studio, The Hot Shop in July 2011 in Eugene, OR. Samuel is well known for his giant multi-piece tropical wall flowers as well as his custom lighting fixtures. His artwork includes: ceiling installations, wall installations, lighting fixtures, vases and other free standing art vessels. 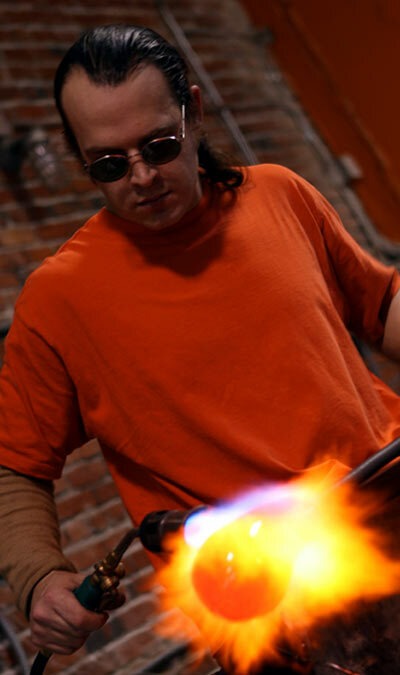 Sam is also an accomplished welder and metal artist; thus he combines glass and metal in much of his work.